Between the Stanley Cup playoffs, minor league championships, the NHL draft and its resulting transactions, trades and Wednesday’s free agent madness, numerous Miami alumni have spent the past couple of months winning trophies and moving to different cities. If all of the activity is giving you a headache, here is the Miami-centric version of recent events involving former RedHawks. LOVERDE WINS CALDER – Defenseman Vincent LoVerde, the captain of AHL Manchester, led the Monarchs to a Calder Cup championship in June. The fourth-year pro who graduated in 2011 tied a career high in the regular season with nine goals, and he went 2-8-10 in 19 playoff games. LoVerde, 26, has already played in 275 professional games, racking up 25 goals and 69 assists for 94 points in the Kings organization. STEFFES A KELLY CUP WINNER – What a season it was for Gary Steffes. 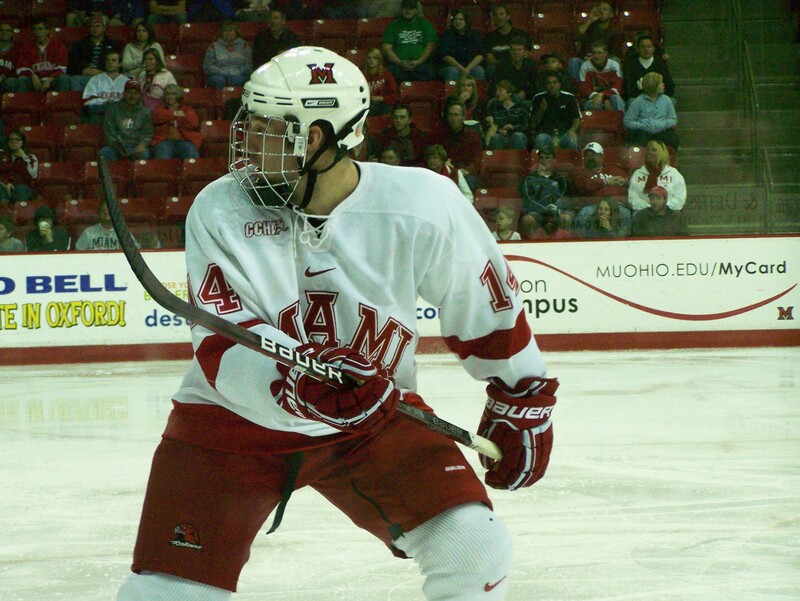 The 2010 Miami graduate scored 61 goals between the regular season and playoffs and capped his year off by winning the Kelly Cup with Allen of the ECHL. Steffes netted four goals in nine games in a call-up to AHL Milwaukee, potted a league-leading 44 regular season goals for Allen – more than twice his previous career high – and tallied 13 more in 25 postseason contests, the second-highest total in the league. In 317 pro games, Steffes has 128 goals and 116 assists for 244 points. BOYLE REACHES NHL CONFERENCE FINAL – Defenseman Dan Boyle advanced to the Stanley Cup conference final as a member of the New York Rangers, playing 19 postseason games and recording three goals and seven assists. Boyle, the only RedHawks alum to participate in the Stanley Cup playoffs, also became the first former Miamian to play in 1,000 regular season games in 2014-15. In addition to leading all ex-RedHawks in career regular season games played (1,019), he is tops in assists (428) and points (581), as well as career playoffs games played (126), goals (17), assists (63) and points (80). PRO SIGNINGS, PLAYERS ON THE MOVE – Former Miamians were involved in a number of transactions between draft weekend and the first day of free agent signings on Wednesday. – Forward Reilly Smith was dealt from Boston along with F Marc Savard to Florida for F Jimmy Hayes. Hayes and Smith played against each other in the 2010 Frozen Four. Smith has 36 goals and 64 assists for 100 points in 203 NHL games with the Bruins. – F Blake Coleman signed a two-year deal with New Jersey on Wednesday. Coleman was drafted by the Devils but did not join a New Jersey affiliate in the spring after Miami was eliminated from the NCAA Tournament. – F Andy Miele was re-signed by Detroit for one year. He finished second in the AHL in points last season with 70. – D Chris Wideman was re-signed by Ottawa for one year. Wideman led all AHL defensemen in assists (42) and points (61) and was tied for the league lead in goals (19). – F Carter Camper, who played in the Boston, Columbus and Ottawa systems, was signed to a one-year deal by Washington. Camper finished with a pro-high 52 points with Binghamton in 2014-15. – F Marc Hagel was inked to a two-year deal by Minnesota. Hagel is coming off his second full pro season, and he went 12-21-33 with AHL Iowa. – F Curtis McKenzie signed a two-year deal to remain with Dallas. McKenzie split time between AHL Texas and the Stars. He went 6-15-21 in 31 games in the AHL, and he was 4-1-5 in the NHL. – F Austin Czarnik signed with the Bruins right after Miami’s season ended, coincidentally ending up in Providence, where the RedHawks played their final game of 2014-15. Czarnik played three games with the P-Bruins, notching two assists. – Though he’s not an alumni yet (thank God), F Sean Kuraly had his rights traded from San Jose to Boston last week. Kuraly will be a senior at Miami this fall and could rejoin Czarnik in 2016. Redhawk95 and Miamibeef04 have graciously invited me to write for this site starting this off-season, and I just wanted to make a short post to express my gratitude and introduce myself. I’ve been a writer for Scripps-Howard for the past 18 years, first with The Cincinnati Post and Kentucky Post and after those publications folded, I stayed on with Scripps-owned WCPO.com, and I also write for the Northern Kentucky Tribune, GetSportsInfo.com – which covers Cincinnati college and pro sports plus fantasy football and baseball – and Tristatefootball.com. I’ve also been a Miami season ticket holder since 2006, and have missed just three games since Cady Arena opened – two to get married and one for my grandmother’s funeral. I started writing about Miami hockey for Trent Rosecrans’ site in 2009, and after he moved on to The Enquirer, I starting writing the RedHawkey blog for WCPO and have done so for the past five seasons. Last March the editor of WCPO.com informed me he is going to remove my blog from its site even though I’ve written hundreds of pieces pro bono over the past five years, generating tens of thousands of hits. Coming from that situation to this one, the prospect of writing for The Blog of Brotherhood is exciting. I look forward to joining two passionate Miami fans as we make this the best source for RedHawks hockey coverage on the ‘net. I also hope to continue providing game analysis and writing player features like I did for RedHawkey. Check back in the next few weeks as we bring you exclusive off-season interviews and roster analysis as we prepare for the 2015-16 season! 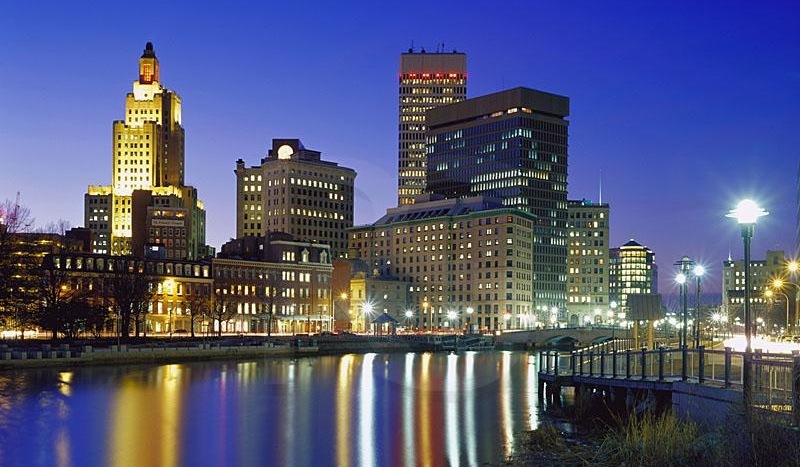 Founded in 1636, historic Providence, R.I. will host the 2015 NCAA Tournament’s East Region. This evening at 6:30 PM EDT the Miami RedHawks, champions of the National Collegiate Hockey Conference, are set to mark their return to the NCAA tournament after a one-year absence. The top seed in the East Region, the RedHawks (4th overall seed) will face fourth seeded Providence College (15th) of Hockey East in their hometown. The Friars last played two weekends ago when they were ousted by New Hampshire in the quarterfinals of the Hockey East conference tournament. The two squads went the distance in the best-of-three weekend series in Providence playing three low-scoring 2-1 games. We could end this post right here, because a low-scoring game is precisely what Miami should expect this weekend. 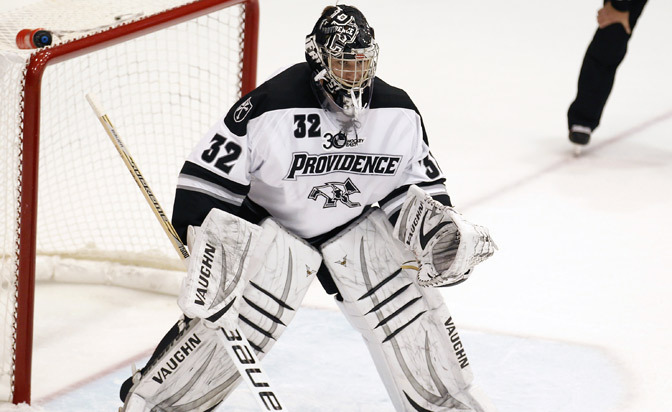 Junior Jon Gillies could sign with Calgary upon the completion of the Friars season. Tomorrow, perhaps? The Friars rank in the top 5 nationally in many defensive categories including goals allowed (3rd) and save percentage (4th) led by junior goaltender Jon Gillies, who’s .931 save percentage and 1.95 GAA each rank 6th best nationally. That said, Miami will run out junior Jay Williams, who’s numbers aren’t too shabby either. Williams actually has a better GAA (1.89, 5th nationally)) than Gillies and his .922 save percentage (29th nationally) ranks just a few spots lower. Meanwhile, Miami is much more offensively inclined boasting three players with 18 or more goals (Blake Coleman and Riley Barber (20 each) and Sean Kuraly 18) but they will be without Coleman, and likely, Barber for the game against the Friars. In fact, the Friars leading goal scorers, Nick Saracino and Trevor Mingoia have just 13 goals each, but Providence does run out five players with 11 or more goals. Maybe not as dynamic as Miami’s top end forwards, but they certainly have depth. That could be a problem for a Miami team suddenly without a lot of it. This is not the first time Miami has seen Gillies. The two schools have met four times over the last three seasons playing, amazingly, four consecutive overtime games. Last year, Miami traveled to Providence and put up a four-spot against Gillies on Saturday night scoring six goals on the weekend. Miami should have some confidence against one of the nation’s best. With both Coleman and Barber likely missing this game, obviously the Crash Cousins, and their size, can play a larger than usual role. Like most Hockey East squads, Providence is relatively small. Miami should use their blend of size and speed to jump on the Friars right away. I’d love to see Rico have the guys throw the body around, but they’ll have to mindful of east coast refs. The NCHC is a big, physical league and the RedHawks are one of the most physical teams in the country. If the refs don’t let the boys play, Miami could find themselves killing far too many penalties despite the Friars woeful powerplay which is converting at a paltry 14.7% clip this year. Ultimately, this game is Jay Williams’ to win. He has to step up and hold Miami in the game. The RedHawks should expect to have to win a 2-1 style game because, 1) we’re missing 40 goals from the lineup, and 2) it’s how the Friars play. Despite missing huge parts of the lineup, this is not your father’s Miami. This is not the team from the CCHA that was hardly challenged over the past decade and then, at times, unprepared for the rigors of the NCAA tournament. But, these RedHawks are the champions of the NCHC, a conference that sent six of its eight teams to the Dance. A conference that is currently 3-0 in the 2015 tournament. After last year’s adjustment to life in the National and life on the road, Miami has figured out how to win in the most dominant college hockey conference in the land. That has to account for a lot. The RedHawks, though missing some big-time talent, have guys that can step up. Miami’s depth will certainly be challenged. As much as I want to pick Miami, overcoming the losses of Coleman and Barber, along with the need to win a tight 2-1 game just doesn’t seem to fit Miami’s run, gun and bang style. But, there is just something different about this team. They’re more battle tested. They’re deep. I think Miami finds a way to get it done but the goal scoring will surprise you. Look for a Kevin Morris or Crash Cousin dirty goal to be the difference. Miami wins. – Williams and the RedHawks’ defense will have to be big tonight because Miami cannot afford to fall behind the Friars and expect to be able to come-from-behind facing such an intensely defensive team. – Unless Miami wins, we MAY have seen the last of Coleman and Barber in the red and white which would be an unbelievable shame considering how their Miami careers could end. Barber is just a junior, but could decide to sign with Washington. However, if his knee injury is severe, the Capitals could be inclined to see how he does in a comeback situation with Miami meaning, perhaps, Barber could also come back to finish his degree. Something I’d assume his family would be quite happy with given his father, Don Barber, collected his degree from Bowling Green before embarking on a successful pro career. When Miami’s season is finished, I’d expect the New Jersey Devils to sign Coleman (a senior) as quickly as possible. – Gillies, Kuraly and Barber know each other well having played together on the US U20 team that won gold in 2013 and then again Barber and Gillies returned for the 2014 team when Barber was captain. Gillies was the main netminder that year for Team USA. 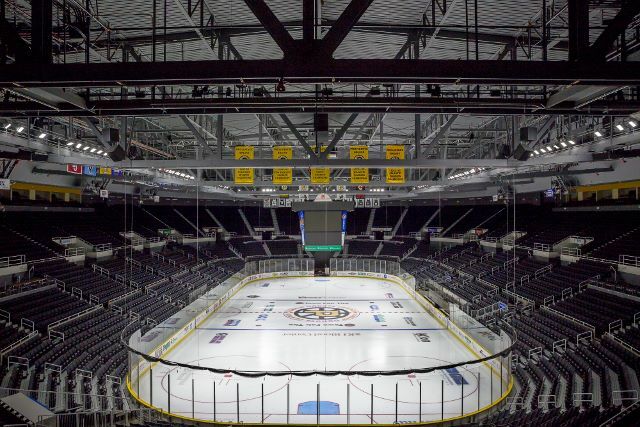 The home of the AHL’s Providence Bruins will host the 2015 NCAA Tournament East Region. – Despite playing at “home,” the Friars have not played a game at the Dunkin Donuts Center since 2004. And, with Providence having a fairly small fan base, the advantage Providence will have shouldn’t really affect the RedHawks. Certainly, this team is road tested playing in hostile environments like the Ralph (UND), Amsoil (UMD) and Lawson (WMU) to say nothing of having made long road trips all year, twice in fact, to Colorado to play at altitude. In other words, Miami has seen and heard it all. Earlier this morning, the Miami RedHawks, champions of the NCHC, learned their NCAA region and opponent. The RedHawks will travel to Providence, R.I. to take on Providence College of Hockey East in a first round East Region game. Miami is no stranger to going east to face HEA opponents as they have done so countless times taking on the likes of UMass-Lowell, UNH and BC over the past 10 years. Unfortunately, the majority of those contests have turned out poorly for Miami as they have been skated out of the rink. But, that’s what’s so intriguing about this draw. 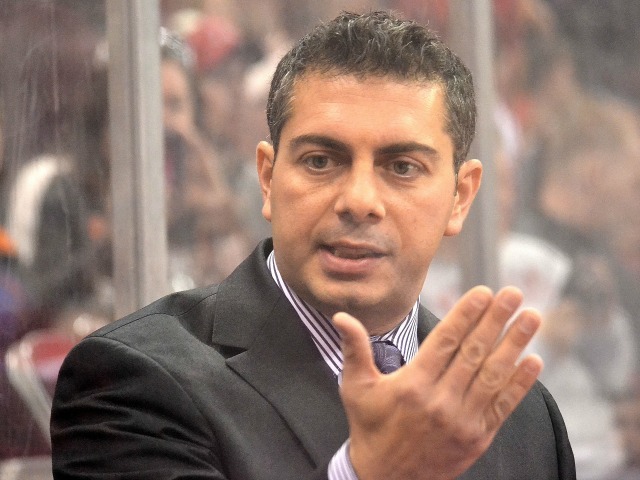 Head coach Enrico Blasi built this team to compete against HEA teams. Smallish, fast forwards who can possess the puck, get out in transition and put pressure on the forecheck are hallmarks of this squad, and seemingly, what’s been done to Miami over the years. And, this year, Blasi added more size with the Crash Cousins and the addition of Scott Dornbrock on the blueline. Simply put, this team is built to win against teams big and small. And, since you can’t do anything about the draw. Go east and win the region. If there was ever a year that Miami would get over this hump, it’s this year with this team of veterans. Honestly, the bracket is pretty good for Miami. Consider Providence. The #15 overall seed should be playing the #2 overall seed. Sure, we’re playing them in their town, but Providence doesn’t have any kind of fan base. The crowd will not be an issue and Miami has gotten used to traveling after two seasons in the NCHC. We should be playing the #13 overall seed, Yale, but at least on paper, may have gotten a break. Providence has great goaltending, but Miami faces great goaltenders each and every weekend in the NCHC. This team should be ready. Also consider the other half of the bracket…BC and Denver. We know all about Denver and have beaten them 3-of-5 times this year. We’re a much faster team than the Pioneers and their goaltending is suspect. As for BC? It’s not a great BC team with average goaltending and not the teams of the past with guys like Gaudreau, Gerbe, Kreider and others that were elite college players. This is a region that Miami can win, but the RedHawks are not without their faults. 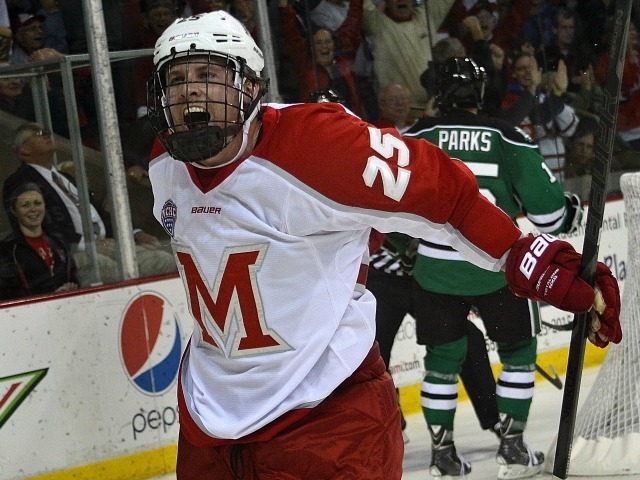 Miami will be missing the services of NCHC tournament MVP, Blake Coleman, for the first round match against Providence. And, who knows the injury status of junior sniper Riley Barber, who’s play has been outstanding the last month of the season. Last we saw Barber, he was being helped on and off the ice with a large ice bag on his left knee. Clearly not a good sign, but let’s hope for the best. I’m sure we won’t know his status until very late in the week. If those two guys are out, it’s on the other leaders to step up. Also concerning is Miami’s goaltending. I’d say it’s been average of late. Clearly the RedHawks will ride Jay Williams, but if I had to take Williams or Providence’s Jon Gillies to win this game, all else notwithstanding, I’d have to say I’d take Gillies. He’s a proven stud in the Friars net. So, Miami fans. A lot to celebrate this season. Let’s hope the boys have four more W’s in them. More to come this week. The Miami RedHawks are the 2014-15 NCHC Champions! On the strength of three Blake Coleman goals, solid goaltending from Jay Williams and spectacular penalty killing, the Miami RedHawks won the second Frozen Faceoff in Minneapolis. The RedHawks defeated a stingy St. Cloud State team 3-2 and have earned a #1 seed in the NCAA tournament. Concerning however, is that Blake Coleman was issued a game misconduct, his third of the season, meaning he will be suspended and miss Miami’s first round tournament game next weekend. And, Riley Barber was injured late in tonight’s game and was seen being helped on the ice by teammates to join the celebration following Miami’s victory. Barber had an ice pack on his left knee as he hopped across the Target Center ice. Coleman was named tournament MVP and Austin Czarnik and Louis Belpedio joined him on the all-tournament team. More to come later, but tune in tomorrow at noon EDT for the NCAA selection show on ESPNU. USCHO.com will have a bracket projection up soon I’m sure so check out Jason Moy’s excellent analysis there as well. The RedHawks return to the Frozen Faceoff looking for an NCHC tournament championship. The RedHawks are back in the Frozen Faceoff for the second consecutive year and like last year, will face Denver albeit in the semifinal rather than the championship game. Miami and Denver have played four times this year splitting two weekends with the most recent contests coming just three weeks ago in the Mile High City. In that series, Miami dominated play on Friday night and Riley Barber and Alex Gacek had two goals in a 5-3 victory before the Pioneers returned the favor drubbing the RedHawks 6-2 on Saturday night. For Miami, this game is simple. Contain the DDT line of Daniel (Doremus), Danton (Heinen) and Trevor (Moore), you limit Joey LaLeggia’s chances from the point and you fire shots against good but not great goaltending (either Evan Cowley or Tanner Jaillet) and you walk away a winner. But, you let that top line get going and Miami will have its hands full. Of concern is that Miami has been lax defensively over the past several weeks. I know Jay Williams played well and got his fifth shutout of the season last weekend (BTW – Can we be done with the goaltender rotation? Let’s pick Williams and move on) but there were also two disallowed goals in Sunday’s series clinching win over Western Michigan that helped retain that goose egg. Miami has to get back to playing sound defensively and needs Williams to put this team on his back. Remember, one of his very few poor games this year was the 6-2 loss to DU a few weeks ago when he surrendered four goals in less than one period of play. He has to put that out of his mind and focus on doing what he’s done nearly all of this year, which is play fantastic hockey. Offensively, Riley Barber is hot. Ten points in his last seven games including six goals. He had three vs. DU in the series in Denver a few weeks back so he can hurt this team. Austin Czarnik is hot. Six goals in his past four games. Blake Coleman is hot with nine points in his past four games. These are the right guys to carry this team. A little defense, a little goaltending and some tenacity from Coleman and friends up front and Miami could really make a run not only this weekend, but next weekend in the NCAA tournament as well. I’m optimistic that this team is peaking at just the right time. Question: Is there anything better than playoff hockey? 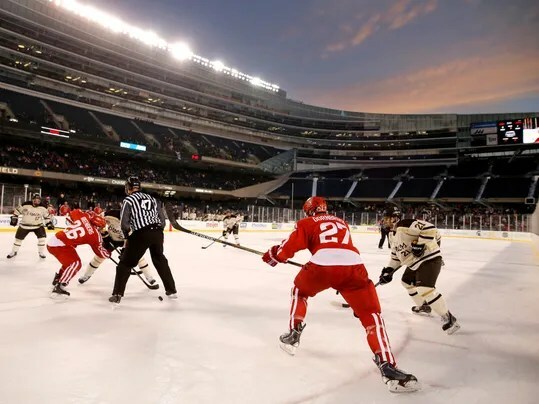 The last time WMU and Miami met, it was under the stars at the Hockey City Classic in Chicago. Now that we’ve established that, the fifth ranked and second seeded Miami RedHawks (21-12-1, 14-9-1-1 2nd NCHC) are back at home for the playoffs for the first time since the 2012-13 season when they needed three games to dispatch Michigan State en route to the final CCHA championship weekend at Joe Louis Arena in Detroit. They will face an old CCHA foe and MAC rival in seventh seeded Western Michigan. The Broncos (13-16-5, 6-13-5-4 7th NCHC) trail the tightly contested all-time series 56-60-11 and went 0-3-1 vs the RedHawks with the only non-loss coming in Kalamazoo a weekend before the Hockey City Classic in Chicago. In that game, Miami led 4-0 after two periods before hanging on to post a 4-3 victory at Soldier Field. In Oxford, it was a more pleasing storyline as the RedHawks swept the Broncos by 1-0 and 5-2 scores and you never really got the feeling that WMU could challenge Miami offensively. Hopefully we’ll see even more offense this weekend after watching Miami put up 44 shots against North Dakota in a 2-1 loss Friday last before putting six goals on the board against likely NCHC Player of the Year, Zane “Five Spot” McIntyre who trolled the Blog of Brotherhood on Twitter. He “favorited” our tweet predicting a Miami sweep of UND last weekend. The problem was that he did it after UND won game one by the narrowest of margins when a fluke goal decided the outcome. Of course he then laid an egg on Saturday surrendering a “five spot” to the RedHawks in a 6-3 Miami victory. Zane “Five Spot” McIntyre trolled the Blog of Brotherhood last weekend. The problem? Five goals against on Saturday night. If you’re going to troll, at least do it before the game. And, if not, you might consider backing up the trolling with decent play. Either way, not good. Anyway, back to this weekend. Miami enters the NCHC playoffs as the second seed nearly pulling off a “worst to first” story. As it is, Miami turned the tables on last year’s 8th place finish on the strength of a 2nd place effort in the regular season. They built upon last season’s successful NCHC playoff run which ended in the inaugural NCHC championship game where they fell to Denver ending up a mere goal short of a ninth consecutive NCAA tournament appearance. This year, an NCAA appearance is all but certain as playoffstatus.com shows the RedHawks as having a 99% chance of reaching the tournament even with two losses this weekend. Last weekend Miami dropped a close one on Friday before Austin Czarnik went off on Senior Night recording four points on the back of his first career hat trick (including two shorthanded goals) to lead the RedHawks to a dominating 6-3 victory over North Dakota. Jay Williams had goaltending duty and played well on Friday save the first goal by UND, which was an ugly, harmless shot from the corner that he inexplicably misplayed. Ryan McKay had the net Saturday and played well enough to win but I think we definitely see Williams tomorrow. Depending on how game one goes, and based on his play, we could see him again on Saturday night. Kenny Morrison is highly regarded as a potential NHL free agent. the blueline, Kenny Morrison (5-10-15) is well-regarded and has been mentioned as a possible early departure risk as NHL scouts are circling the would-be free agent. In net, Lukas Hafner has had a good season including last Saturday’s shutout of #6 Minnesota-Duluth in Kalamazoo. Hafner (11-11-5, 2.35, .916) took the reins from senior Frank “The Big” Slubowski last season and has played the majority of the minutes in the WMU net this year. He has the talent to keep WMU in these games and could even steal one if Miami isn’t getting traffic in front and pucks to the net. Like last weekend, Miami should attempt to make these games up and down affairs and fire more than 40 SOG to wear down the Broncos and their netminder. Interestingly, the Broncos have four players with 50 or more PIM this year with three of those four having 70 or more. In contrast, Miami has just one, senior Blake Coleman (80 PIM) so this will definitely be a clash of styles. WMU likes to muck it up and play in your face using their size and physicality. That said, they feature uber-goon Mike McKee who is really worse than a goon. He’s a cheap, dirty player. Miami will have to keep their composure because WMU head coach Andy Murray will want his guys in the faces of Miami’s talented and smallish forwards. Overall, this is a very good matchup for Miami on paper. While I believe Hafner could steal a game for the Broncos, I don’t see it happening. I think Miami will take care of business in two tightly contested games. MIAMI SWEEPS. By the end of the weekend, Miami hopes to once again pose with hardware. This time as NCHC champions. As Miami returns home for the final two games of the regular season, could there be more drama in the air than what’s flying around in Oxford, Ohio? Fifth ranked Miami (20-11-1, 13-8-1-1 2nd NCHC) will close out the season against #1 North Dakota (24-6-3, 15-5-2-0 1st NCHC) in a battle of two teams that have spent the majority of the year ranked in the top 10. Should the RedHawks sweep, they will claim a share of the NCHC regular season title and the #1 seed in the NCHC playoffs. Though the teams will be tied atop the standings, Miami would claim the top seed by virtue of its 3-1 record against UND. Alex Wideman is one of six Miami seniors who will play the final regular season games of their career this weekend against North Dakota. season games at Steve Cady Arena with a chance to earn their second regular season championship of their remarkable careers. No Miami class has won more than one regular season championship in program history. 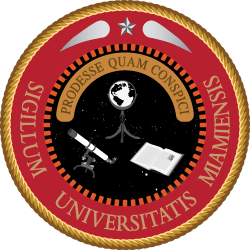 No Miami class has EVER won two regular season championships in any four year period in the history of the university, which of course, dates back to 1809. Probably overly dramatic since the hockey program has only existed since 1978 — pure semantics. This class could become the first to do so after capturing the CCHA’s final regular season title at the conclusion of the 2012-13 season. North Dakota is a storied program that’s won seven national championships and fifteen, now sixteen, regular season titles. Getting a share of the NCHC title in our second year in the conference would be fantastic. It took Miami 15 years of program existence and 13 CCHA seasons to win a regular season title in that now defunct league. And, to do it against North Dakota would be even sweeter. Like most of the top teams in the NCHC when pitted against one another, and certainly Miami has seen this, the squads split a series in Grand Forks back in November with Miami winning 3-2 on Friday before dropping the finale 4-1. In the Miami win, Jay Williams had to make just 21 saves and Sean Kuraly had two goals to lead the RedHawks. Ryan McKay struggled in the Miami net in the loss as North Dakota started junior Zane McIntyre both nights. Certainly Miami would like to replicate the Friday victory as they limited UND to just 23 SOG and controlled the green and white with tight checking defense. UND comes to Oxford on a roll having won four in a row. Their last non shootout loss was a 3-2 OT setback to Omaha way back on January 30. And, their last regulation loss? January 9 to UMD. 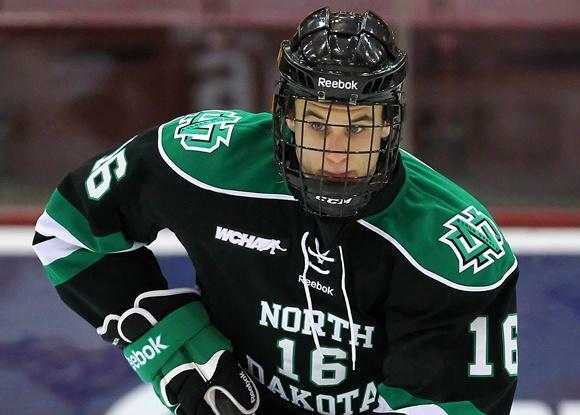 The loss of senior assistant captain Mark MacMillan will be difficult for North Dakota to overcome. fractured his foot and I’m assuming surgery was required to fix what was likely an ugly injury. But, I’m speculating. Regardless, MacMillan won’t play this weekend, and I’d find it hard to see him returning for the remainder of his college career, but never say never. UND is led by its d-corps which boasts numerous NHL draft picks and junior netminder Zane McIntyre who shared the USHL’s goaltender of the year award with Miami’s Ryan McKay just over three years ago. Up front, speedy Drake Caggiula (15-16-31) leads an attacking set of forwards including Michael Parks (12-19-31) that are a handful but perhaps not as talented as Miami’s crew led by Czarnik, Coleman, Murphy, Kuraly, Anthony Louis and Riley Barber. That said, UND will want to slow things down. Miami, on the other hand, should look to run the green and white out of the building. Forty shots on net each night should be the goal. Well, here we are. The end of another solid regular season and the end of a bounce-back year for the program. While it’s too early to hand out accolades, the team has played hard and well enough to have earned the chance to win a regular season title on home ice. Miami fans are crossing their fingers that Captain America has returned. weekend playing hard, inspired hockey. If Barber is ready to roll, look out this weekend and for the rest of the year. However, questions abound in net as neither Ryan McKay, and most certainly Jay Williams, looked overly strong. McKay allowed three goals in Friday’s win, but Williams was ineffective surrendering four goals in less than one period of play. McKay steadied the ship when he came into the game, but still gave up two goals after Miami attempted to crawl back into the contest at 4-2. Whomever Blasi goes with (I’ll bet it’s McKay on Friday) has to give this team a chance to win by scoring three goals because getting more than that against UND just isn’t realistic. Miami has to be prepared to win two slugfests. These two teams are very evenly matched with the defensive and goaltending edge belonging to UND. That said, I’d probably give the RedHawks an advantage up front with, in my opinion, more top-end guys, more game-breakers than UND which really has a grinding offensive mentality. Miami could earn a significant size advantage this weekend, especially if head coach Enrico Blasi chooses to dress both Crash Cousins. Even with one or the other in the lineup, and Miami’s size on the blueline, they match up quite well in both the size and speed categories. But, with UND missing one of their best players, the excitement around the weekend, senior night, and what it means to Miami (home ice, #1 seed in the NCHC, Penrose Cup, redemption for last year, NCAA seeding on the line, etc., etc. ), I’m going to call a MIAMI SWEEP and watch the RedHawks skate off Saturday night with the Penrose Cup. The Voice of the RedHawks, Greg Waddell, will be back on the radio this weekend as both games will be available at MURedHawks.com and over the air at 1450-AM (Saturday only) and 1490-AM. Friday’s game will be nationally televised on CBS Sports Network which unfortunately means no NCHC.tv for Friday. Saturday’s regular season finale will be streamed through the league’s package and also available on Time Warner Cable (Chan. 311 & 1311) and on Fox College Sports Pacific (DirecTV Chan. 608, Time Warner Chan. 321). This weekend marks the final weekend of the NCHC regular season before beginning NCHC Tournament play next weekend. No. 1/1 North Dakota has already clinched a share of the Penrose Cup, awarded to the NCHC regular-season champion. UND needs just one point at No. 5/5 MIAMI this weekend to win the title outright. The RedHawks need to sweep UND to also get a share of the title, which would then give MIAMI the No. 1 seed in the NCHC Tournament and make UND the No. 2 seed. North Dakota enters the top-five series with MIAMI riding a four-game win streak and seven-game unbeaten streak (6-0-1), which is the longest active unbeaten streak in the NCAA. With its share of the Penrose Cup, UND has secured its 16th conference championship in program history, the most of any NCAA Division I men’s program. Four teams (MIAMI, Omaha, Denver and Minnesota Duluth) are separated by just five points with two games to play, while only three of those teams will get home ice for the NCHC Quarterfinals. UMD currently sits in fifth place on the outside looking in, but can make that up with at least three points and some help this weekend. UND has already secured home ice. Tiebreakers for seeding, should they be needed, are listed on page 8 of the release. More information on possible place finishes for these teams are listed below. According to the KRACH Ratings, the eight NCHC teams have played the eight toughest schedules in the country this season, led by Minnesota Duluth and St. Cloud State at No. 1 and 2, respectively. Omaha, Denver, MIAMI, CC, WMU and UND round out the top eight, respectively. The jewel of the west, Denver, awaits #5 Miami this weekend. Fresh off a thrilling come-from-behind victory on Saturday night to gain a valuable series split against Minnesota-Duluth, fifth-ranked Miami heads west for their final road trip of the 2014-15 regular season to take on #7 Denver at Magness Arena. This will be the third and fourth meetings of the season between the two rivals after splitting a series in Oxford just a month ago. That series saw Miami (19-10-1, 12-7-1-1 2nd NCHC) play both Jay Williams and Ryan McKay with Williams getting out-dueled by Denver (18-10-2, 11-8-1-1 t3rd NCHC) freshman netminder Tanner Jaillet when he surrendered just two goals before Miami picked up a dominating 4-1 victory on in front of McKay on Saturday night. These will be the 16th and 17th all-time meetings (8-7 DU) and the 8th and 9th in just the past two seasons as the teams played five times last year including the NCHC championship game where the Pioneers defeated the RedHawks to advance to the NCAA tournament. Freshman forward Danton Heinen leads DU in scoring this season. interesting because only one defenseman in the last 10 years has won a conference scoring title — Torey Krug at Michigan State in 2011-12 (he actually shared the title with Michigan’s T.J. Tynan). Notable is that Denver senior forward Zac Larraza (11-7-18) is suspended for Friday night’s game due to an illegal hit delivered in the Pioneers sweep of Colorado College last weekend. Larraza notched 1-1-2 in the series last month so his absence could be beneficial to the RedHawks. He will be eligible to return to the lineup on Saturday night. Last weekend, Miami gutted out a split of their series against UMD dropping Friday night’s game 3-1 and climbing out of another 3-1 hole to win 4-3 in overtime on Blake Coleman’s 12th goal of the season on a pretty 2-on-1 feed from sophomore Anthony Louis. The two of them also finished a rush on Friday that netted the team’s only goal. Overall, Miami is still looking inconsistent offensively as they’ve now tallied 3, 2, 1 and 4 goals over their past four games despite playing two of those against the league’s worst in Colorado College. Friday night was so bad, at least in head coach Rico Blasi’s estimation, that he benched Conor Lemirande, Chris Joyaux, and yes, Riley Barber for Saturday’s finale. Sooner or later Barber is going to have to determine if he wants to be a competitor. For as much as I praised him for his efforts two Friday’s ago at Colorado College, that’s been the exception. He just doesn’t look like he cares all the time, which is too bad because guys like Czarnik, Coleman and Murphy deserve better in their senior seasons to say nothing of guys like Dornbrock, Paulides and Kuraly who consistently give a full 60-minute effort each night. Hopefully the message has been received and we’ll see a rejuvenated and committed Barber down the stretch. If he plays to his talent, Miami could be in for a terrific run in March and April. Senior captain Austin Czarnik continues to lead the RedHawks on the ice and in the scorebook. Senior captain Austin Czarnik continues to pace Miami with 2-28-30 and leads all active players in career points (154 — tied with Minnesota’s Kyle Rau). Czarnik is trailed on the Miami team by Barber (13-14-27), Louis (6-18-24), Coleman (12-12-24) and Sean Kuraly (15-6-21) who leads the squad in goals. Defensively, Miami has been fairly strong and has gotten respectable goaltending from Williams, and on Saturday, McKay. I suspect we’ll see Williams on Friday and Blasi will take it from there pending the outcome and his play. I’d also like to see more Colin Sullivan now that’s he’s recovered from an injury that cost him most of the first half of the season. Getting an opportunity last Saturday, he looked smooth and fleet of foot — something Miami can use more of against the top tier teams they’ll face from this point forward. This is a huge weekend for both teams as just three points separates the two teams. NCHC seeding. PairWise implications. Playoff home ice…a lot on the line! And, as with two weekends ago in Colorado Springs, Miami will be battling the dry, snowy altitude here in Colorado and will have to dig deep to compete for 120 minutes. It was no secret that Miami looked gassed at 6,000 feet on the big ice late in the game Saturday night at Colorado College. It’s encouraging however that they were just here and their bodies should be more acclimated to the altitude and they’ll also get to skate on a regulation ice surface this time out. As with most of these elite league series, I’ll call a split but Miami will have to work hard on the road to get it. Miami looks to strengthen its grip on home ice and a NCAA tournament berth this weekend vs. UMD. Starting with this weekend, things are about to get real for the 6th ranked Miami RedHawks over the course of the regular season’s final three weekends. This weekend, Miami (18-9-1, 11-6-1-1 t1st NCHC) faces #7 Minnesota-Duluth (18-11-1, 10-7-1-0 4th NCHC) in Oxford. Earlier this season, the schools split a series in Duluth playing two tight one-goal games with Miami winning the first night 3-2 and dropping the finale 4-3. The series over Halloween weekend was a fright-fest for special teams. On Friday, Miami netted two powerplay goals getting the game-winner from Sean Kuraly in the third period, who has nine such tallies this year, good enough for second nationally (Austin Ortega of Omaha has 10). While on Saturday, Miami erased a 3-1 deficit but came up short as UMD got the game-winner on their second powerplay tally of the night in the third period. Blake Coleman had three goals that weekend (including a penalty shot tally) and was clearly the best player on the ice. He’ll have to be again if Miami is to get a win or two this weekend. Offensively, the Bulldogs are led by forwards Alex Iafallo (7-16-23) and Dominic Toninato (14-8-22). While not as dynamic as Miami’s top forwards, they get the job done. Both UMD and Miami have four players with 21 points or more, but Miami can run out more top end goal scorers. UMD has just one player with 10 or more goals (Toninato) while Miami has four who have notched at least 10 showing the scoring depth the RedHawks possess. Defensive, UMD is a rugged group led by hard-hitting Carson Soucy and Andy Wellinski who adds a scoring touch from the blueline with seven goals on the year. In net, freshman Kasimir Kaskisuo has played 83% of the minutes in the blue paint compiling a 15-9-1 record with a solid 2.31 and .911 slash line. For Miami, I’d expect both Crash Cousins to be in the lineup to counter UMD’s physicality and I suspect we’ll see Jay Williams tonight for certain. Because he played both games in Colorado Springs last weekend, it’s reasonable to believe Miami head coach Enrico Blasi has selected Williams as the #1 ‘tender for the reminder of the season. Unless Williams plays poorly or is injured, I’m willing to bet he’ll be in there on Saturday as well. This will be the just the sixth and seventh all-time meetings between the schools (UMD leads 3-2). Expect a low scoring weekend with Miami netting just five goals last weekend at Colorado College and the defensive responsibility with which UMD plays. If Miami could make the weekend an up-and-down track meet, it would favor the RedHawks with their team speed and skill up front. As with many of these high-profile NCHC weekends this year, I’ll pick a split. Tonight’s contest starts at 7:35 PM and Saturday’s finale at 7:05 PM. Greg Waddell will have the call for both games which be heard at MURedHawks.com and over the air on 1450 AM and 1490 AM. Additionally, both contests are televised on Time Warner Cable (Ch. 311 & 1311) and Saturday’s game will also air on Fox College Sports (DirecTV Ch. 608, Time Warner Ch. 319). #1 North Dakota at Western Michigan – The Broncos can help Miami with a victory or two this weekend over the nation’s top ranked team. #5 Omaha at St. Cloud State – Ditto for the Huskies. Wins over the Mavericks will help Miami’s cause in the NCHC standings. #9 Denver at/vs. Colorado College – The Front Range rivals conclude the season’s battle for the Gold Pan with a home-and-home. Should the Tigers find a way to get a win in this rivalry series, it would help Miami dramatically in their effort to secure home ice in the NCHC playoffs. Sean Kuraly is second nationally with 9 game-winning goals. in the country with nine game-winners this season, just one away from tying the record also. In a battle of top-seven teams, No. 7/7 Minnesota Duluth travels to face No. 6/6 Miami. Expect a lot of shots to be fired as Miami and UMD rank first and second, respectively, among NCHC schools in shots for (34.46 /33.53), shots against (25.14/25.93) and shot margin (+9.32/+7.60). The two teams are third and fourth nationally in terms of shot margin as well. NCHC teams scored two short-handed goals last weekend and now have three of the top 12 teams nationally in short-handed goals. No. 1/1 North Dakota leads the NCAA with nine short-handed tallies, while UMD is tied for second with seven shorties and Miami is tied for seventh with five. The NCHC has six players with two short-handed goals this season, which is among 27 players nationally tied for the NCAA lead with two short-handed goals. Four of the six play for UND while Miami and UMD have one each.